As stated the other day, I'm glad to wave goodbye to January. So much is going on in February that I will be super busy. But it is all good stuff. So, onto fabric. 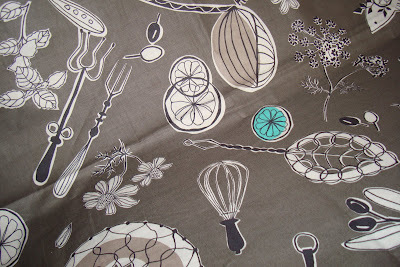 You know I love vintage, love kitchen fabric and I love novelty. 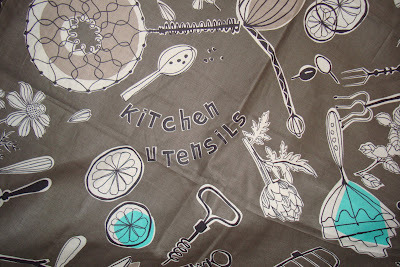 This reproduction mid century kitchen print fits all of my loves. I found it at Sew Mama Sew. It is made in Japan. I really like the colors and shapes and all the kitchen utensils. I like the offset of the print colors, scale, and the mix of food and flowers. I really like the open space in this one too. Well, my daughter Natalie came into my sewing room last week and looked at it with interest. 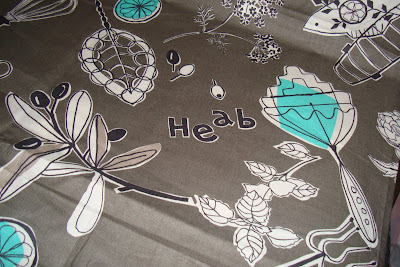 Then she said "What does that mean - HEAB?" I hadn't noticed that word printed on the fabric, yet. I laughed. This happens from time to time with Japanese print fabrics. They get it slightly wrong. But I sort of find that charming. She then said "I suppose them mean herb." I think she is right. I got a good laugh out of it. 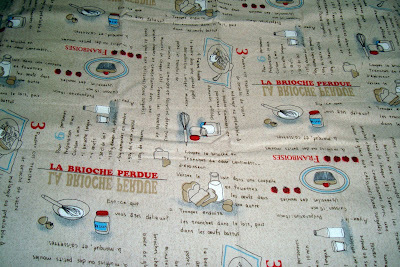 I don't speak french so I'm not sure if there are mistakes in this Japanese kitchen fabric. I thought the scale was perfect for fussy cutting. 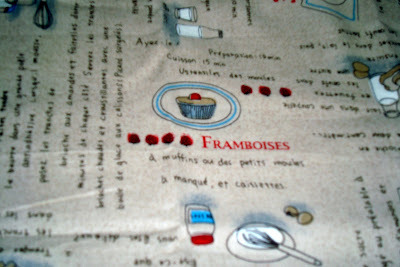 I like fabric with words written, even if they are unreadable. That cupcake is just so cute. This Japanese print is a fussy cutter's dream. 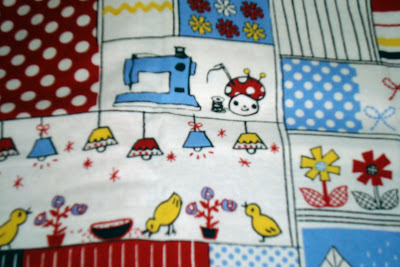 I can see use for nearly every square of this fabric. Can't you just see a window in a little house with those lights hanging in the middle or that sewing machine inside a window. 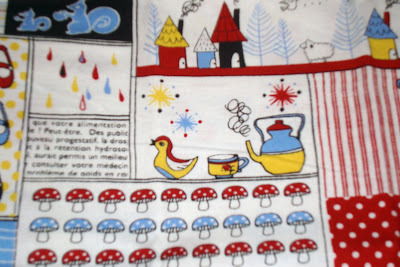 The kettle, bird and cup are perfect for my Kettles in the Kitchen quilt that I'm teaching next month. 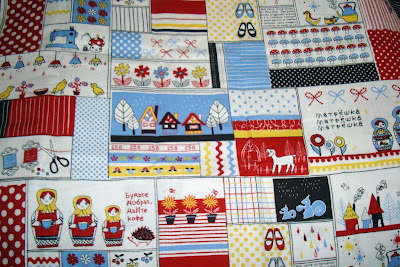 I'm going to cut up squares to hand out to the ladies in my class for their kitchen windows. 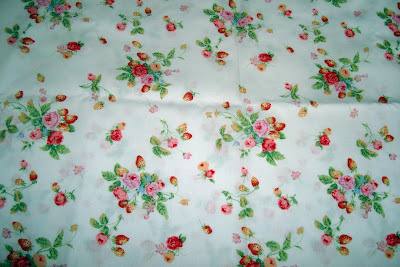 I am going to use this floral in grandma's bedroom of my Little Red Riding Hood quilt. 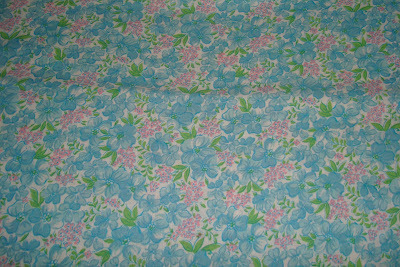 This vintage fabric was given to me by Sandi. I am going to use this for the basket quilt I'll be making at the retreat in Bryce, Utah next month. Thanks Sandi. FYI, I think I finally made a decision on the washer/dryer. Shelbie and I are off today to make the final choice. This has taken forever but we've been able to eek out loads here with the broken machine while I did research. It was funny. One time the washer stopped agitating mid cycle and Shelbie had to get a stick and stand there stirring the laundry before putting it into spin cycle. That was pretty much the final straw! Have a good weekend all. Thanks always for your kind and thoughtful comments. Our first meeting of the year was a complete sell-out. Not a seat left in the room. It was nice to have some new faces. Paula and Flora always say some people try us out and they "stick" and some just drift away. 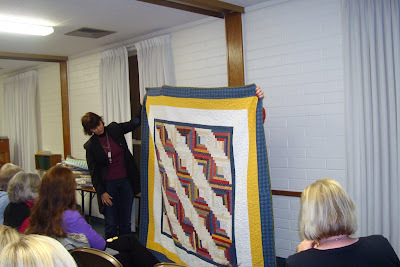 Everyone is welcome at our quilt group. We meet the last Tuesday of every month (except December) at 8:00 PM. 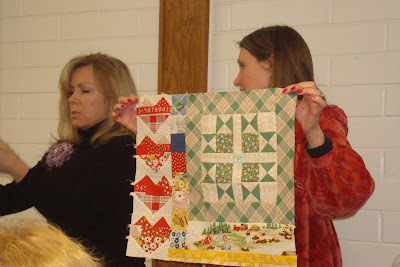 Jina and Paula discussing our group quilt for the year 2010. 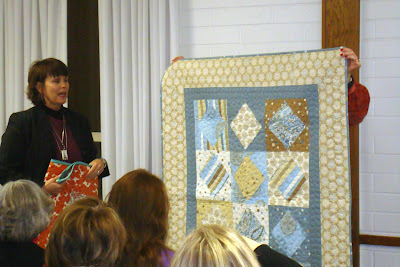 Jina has designed it and the quilt blocks are free for anyone. Jina has put the instructions online. You can access them here. 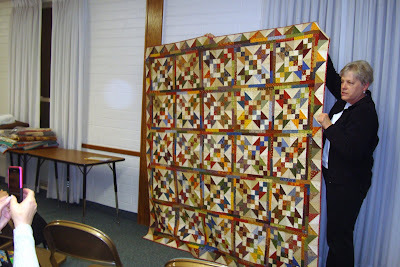 Jina (one of our local celebrity quilters) designed the quilt and each month we are supposed to make one block to keep up. 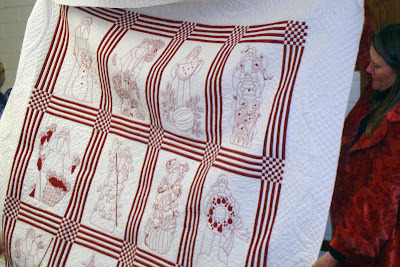 I really want to make this quilt so I'd better carve out the time! Paula is in charge this year. Paula is funny and amazing with incredible style. Look at this lovely coat she made. Unbelievable. It has pink satin lining. 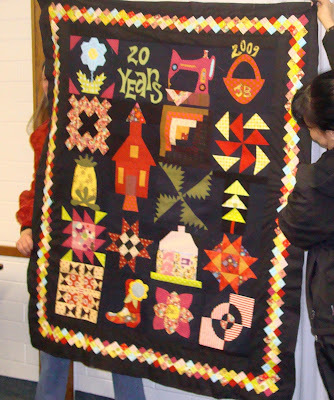 Here is Jina's Alpine Quilt Group Turning 20 Years quilt she finished from 2009. I love it. Black sets off the sampler blocks so well. That Jina, she sure is talented. And look at her border. So unique and well done. Bravo Jina. Now onto Show-n-Tell. 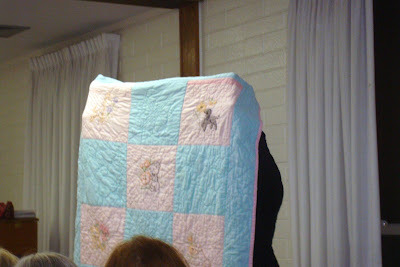 I was talking so I missed photographing Flora's other 2 quilts. Darn. 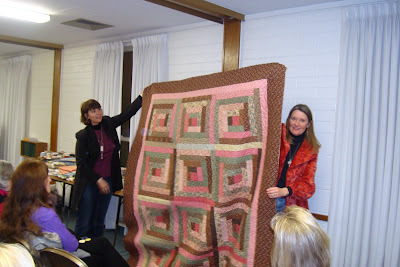 She made this one for her daughter Annie. 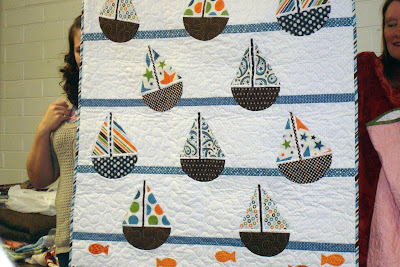 I love wonderful applique like this. The colors and pattern are just so artistic. 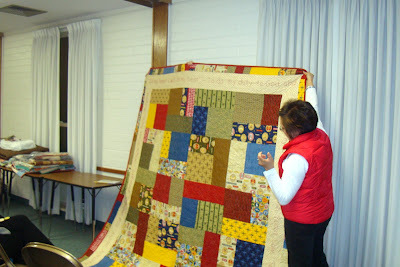 Judy belongs to the few of us that can quilt to perfection both in piecing and in hand quilting. You should see her work up close. It is simply breathtaking. 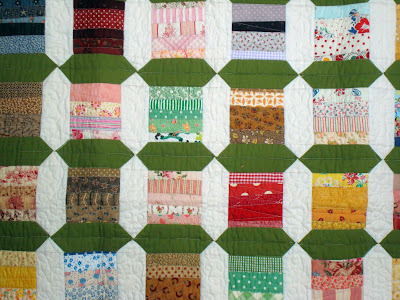 I've always wanted to make this quilt pattern, or one like it. Someday. Another one by Judy. Can you believe this! She stitches just as well as she does everything else. 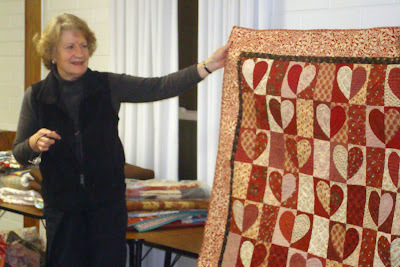 Yvonne's valentine quilt. Very sweet. 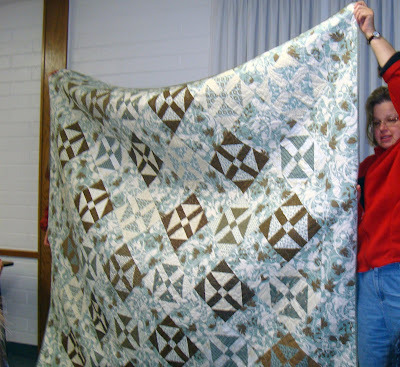 Moana made this quilt for her last son when he finished his Eagle Scout Project. The fabric is perfect - Scouting fabric. 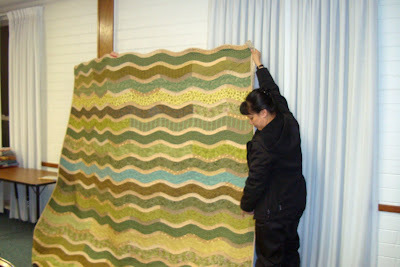 Jodi's wavy quilt. Jodi does curves so well. You could say Jodi's curvaceous! 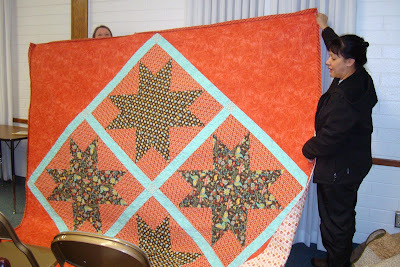 Jodi used this Riley Blake fabric to make this big star quilt. It is king sized. 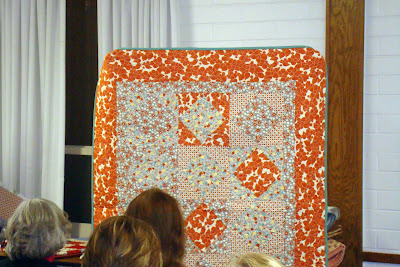 Laurel made this design from a quilting magazine. Laurel's blocks are so incredibly precise. I love the sail boats. They look like rain drops. 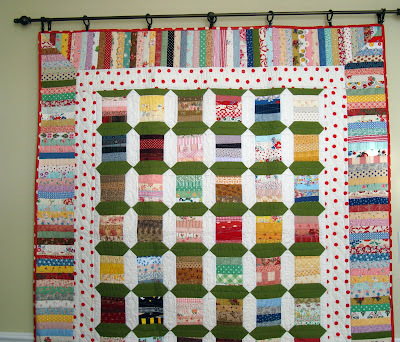 This is a vintage baby quilt from Lorri's brother. 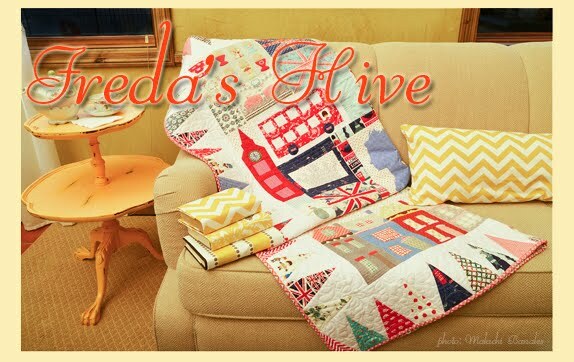 She's got such a great selection of vintage quilts. Sammi was our guest speaker. 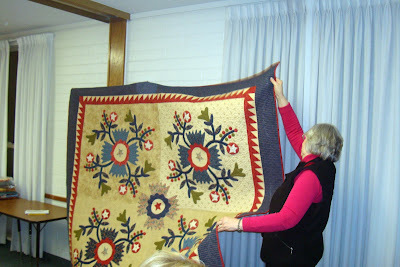 She used to be a local gal and she came back to show us her beautiful quilts. You can see another view of Paula's fabulous coat there, too. Sammi loves log cabin, as do we all. She said this is one of her favorites that has been washed and used and loved. Square in a square pattern. I love this pattern, too. 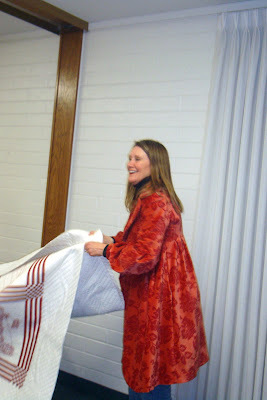 Sammi travels a lot with her job and takes her featherweight with her and sews on the go for herself and her big family. Another square in a square. Isn't the orange lovely? I had to leave early at 9:00 so I didn't catch the rest of Sammi's show. Darn it. I had some other photos, too. But I left out the blurry ones. That always happens to me. 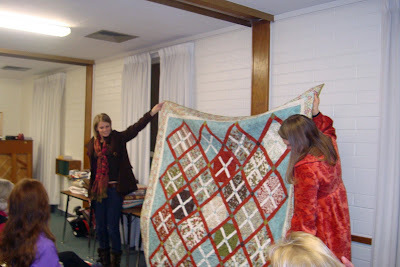 Quilt night is always so fun. Thank you Thank you for all your support and sweet comments on my last post with the spool tutorial. I have been busy and haven't responded to comments but I'm so grateful for all your input. The tutorial was picked up by Whip Up. It is always really fun to share something I enjoy and have people like it. Thank you. 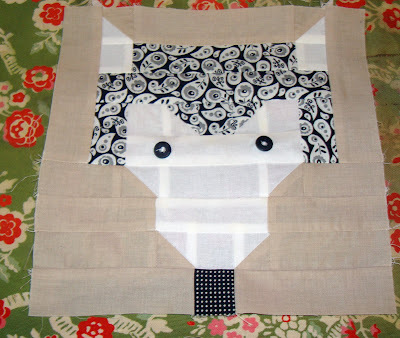 So I've been working on my Red Riding Hood quilt. 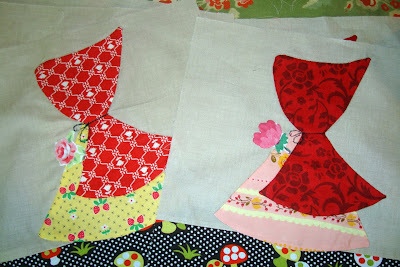 I finished little Red and the basket blocks. So now I'm on to my next 2 blocks. The one above is grandmother's bed with who in it? Is it grandma or the wolf? I wanted it to be a mystery so the sunbonnet sleeping cap seemed the way to go. My favorite is the fussy cut picture on the wall. 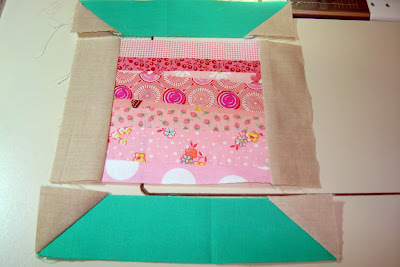 I used decorative machine stitching to create a frame around it. 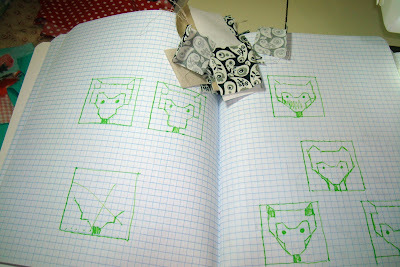 Here is my starting sketches for the wolf block. 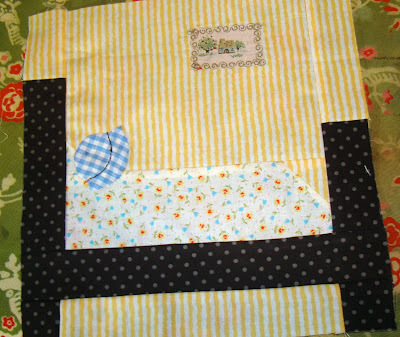 This is not an easy block for me and I confess I had doubts about making this block. You can see my little snippets of fabric left over. So here is my block. I'm still a little unsure of it. I may tweak it a bit. 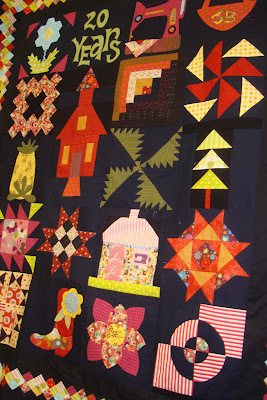 There are lots of little pieces in it but it is not paper pieced. It is made with units of squares and then the squares are put together. We'll see where this takes me. I put the finishing touches on Red's cape. I'm not great with embroidery but the black stitches are the finishing touches needed. The flowers are what I call "fussy cut applique". I fussy cut the flowers leaving just enough edge to roughly needle turn around the flower. It is a little imperfect but I like the effect. I don't know about you, but spring cannot come fast enough. I'm so done with January! 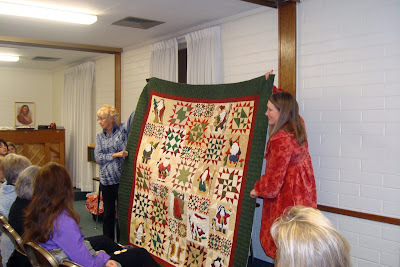 Last Friday I showed my spool quilt from scraps and strings of fabric that I made several years ago. I had so many sweet comments and also some questions so I decided to do a little tutorial showing you how incredibly simple it is to make this spool block. 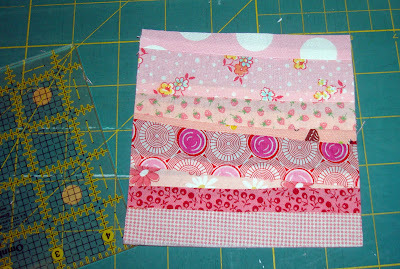 I pulled pinks from my scrap bin making sure they were at least 4 1/2" in length and various widths. I cut a neutral fabric with 2 strips 4 1/2" x 1 1/2" and 4 squares 1 1/2". 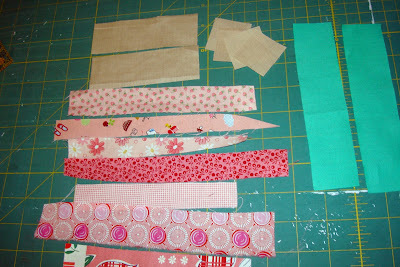 You can use any color fabric to represent the spool, cut 2 in 6 1/2" x 1 1/2" lengths. 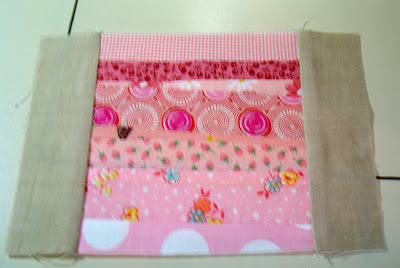 I sewed the pink strips together and using my 4 1/2" square ruler I sliced off the edges to make the pink 4 1/2" square of string/strips. My idea was that by putting like colors together it would look somewhat like variegated thread when the block was finished. Oops this turned out blurry. 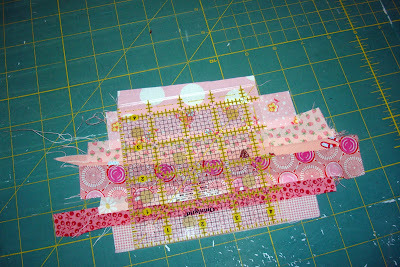 I then stitched the 2 neutral strips I cut 4 1/2" x 1 1/2" to the sides of the pink block. 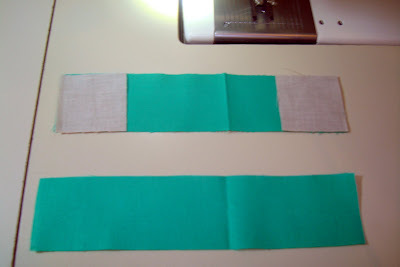 Using the snow ball method I placed my 1 1/2" square neutral squares to the ends of the turquoise strips. 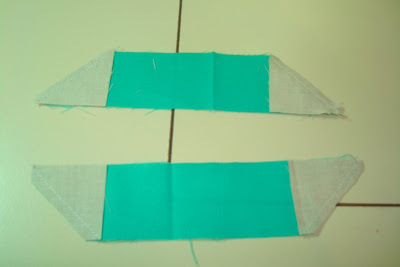 I stitched along the diagonal from corner to corner attaching the turquoise strip to the neutral squares. I trimmed a seam allowance and then pressed the seam outwards. 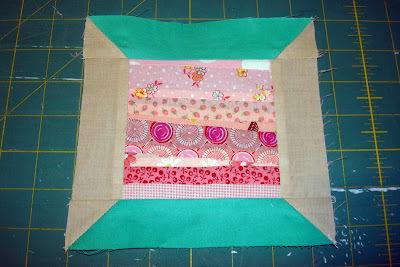 Placing the turquoise strips as above I stitched the ends to the pink block to make the spool. And with a finish press I have my completed spool block. From start to finish this block can't take more than minutes. Could it be easier and more fun? 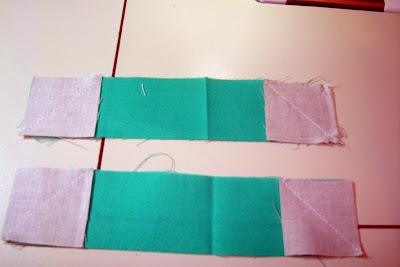 Obviously stitching the strings or strips together can be production sewn in between projects (ala leaders and enders style) and then cut into individual blocks and finish sewn later. Life is sometimes just a big Wack-A-Mole game. You just get one mole wacked and another pops up! 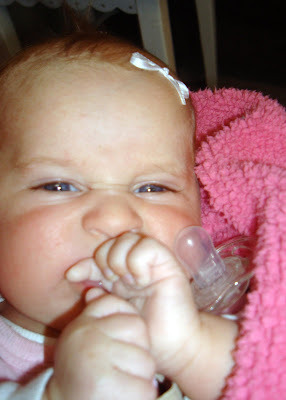 After Christmas I thought I had a cold but it ended up being full blown influenza. However, I'm recovering and feeling mostly like myself now. So it has kind of put a kink in my after Christmas sewing. Last week my daughter Tracey was visiting from Oklahoma where she and her husband live/work and attend school. It was really nice having her with us as we really missed them at Christmas. 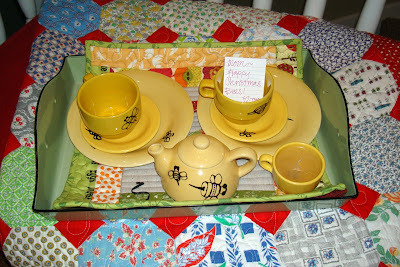 She brought me the sweetest bee tea set. I collect tea sets and this was a fabulous addition to my collection. Oh, I love bees and I love seeing it how she staged it in my green tray. Thanks Tracey! I love surprises. Yesterday I had a another fun surprise. My BFF Lori Holt sent me a get well package. Lori knows me as if we had been friends for years. 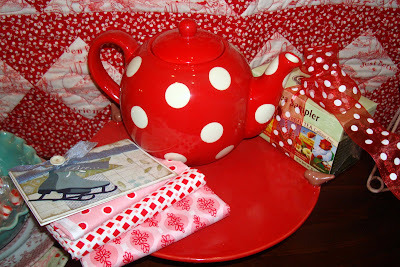 She sent this totally wonderful and so "me" red dotty teapot along with some soothing herbal teas and red and pink fat quarters. The teapot is microwavable. It will be so used. Thank you Lori! Tonight I choose the lemon zinger tea. Ahh. So other than getting better, working on a few new blocks, being with Tracey and my family, I have had some good Allison time. She's got such a personality. And she is so much fun. She loves her Nanny. 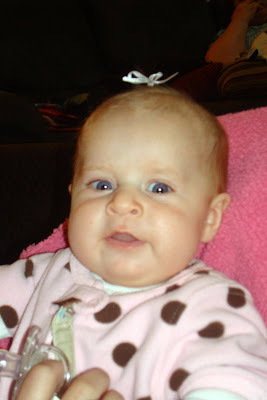 She always has a smile and some coos for me. Update on choosing my washer/dryer/phone: Thanks so much for all the input. I think I have my mind made up on what I will buy. One of my kids tinkered with the washer and it started working again but I know it is only a brief respite before that "mole" raises it's ugly little head again and I find myself plunking the $ down for the new appliances. Also, my phone works about 70%, about 40% of the time. I haven't had time or felt like fixing the problem yet but it has put a crimp in my ability to keep an eye on my blog (along with being sick) and answer email. So if you asked me a question and I haven't answered, please email me again and I will be more responsive. What did I do on my Christmas Vacation?